Objective: Nigella sativa (NS) has been shown to have some effects on the central nervous system. In the present work, anxiolytic and anti- depression effects of an acute administration of hydro- alcoholic extract of NS was investigated in rats. Materials and Methods: The rats were grouped and treated 30 min before conducting the behavioral tests: (1) saline as a control group, (2-4) three groups including NS 100, NS 200 and NS 400 treated by three doses (100, 200 and 400 mg/ kg) of NS. The animals were examined using Forced Swim Test (FST), Open-Field (OFT) and Elevated Plus Maze (EPM) tests. Results: NS extract improved the time spent, crossing number and traveled distance in the central zone in OFT compared to the control group (p<0.01- p<0.001). The time spent in the peripheral area of OFT by all animals’ treated groups was lower than that of control group (p<0.01 and p<0.001). Compared to the control group, all three extract treated groups showed greater total crossing and total traveled distance in OFT (p<0.05-p<0.001). Compared to the control group, the animals treated by 200 and 400 mg/kg of NS spent longer times in the open arm of EPM (p<0.05 and p<0.001). All three doses of the extract shortened the closed arm entries compared to the control group (p<0.001). The animals of NS 200 and NS 400 groups spent lower times in the closed arm compared to the control group (p<0.01 and p<0.05). In FST, the immobility times in the NS 400 group were lower than control (p<0.05). 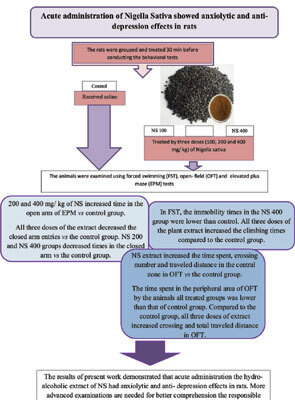 All three doses of the plant extract increased the climbing times compared to the control group (p<0.01 - p<0.001). Conclusion: The results of the present work demonstrated that acute administration of the hydroalcoholic extract of NS had anxiolytic and anti-depression effects in rats. More advanced examinations are needed for better comprehension of the responsible compound(s) and mechanism(s). Anxiety, anxiolytic, central nervous system, depression, Nigella sativa, rats.